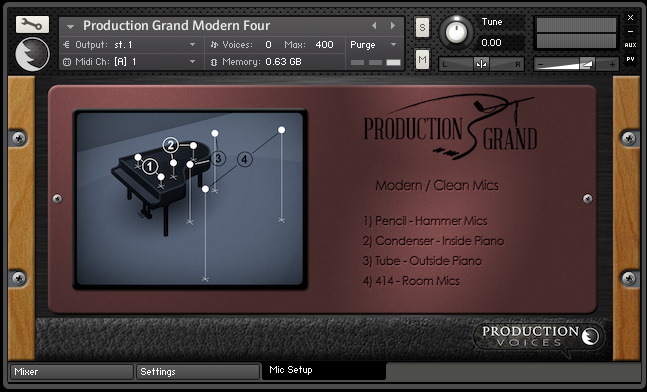 Production Grand Modern Four is a high-quality piano sample library for NI Kontakt 4.2 and above, consisting of four microphone perspectives and over 21,400 samples of a Yamaha C7 grand piano recorded in a world-class recording studio. Production Grand Modern Four is the downloadable “Production Grand Modern Silver Edition” from the larger Production Grand. Production Grand Modern Four contains the Modern Silver 16 bit 44.1 kHz edition of Production Grand. It has the first four modern microphone perspectives. 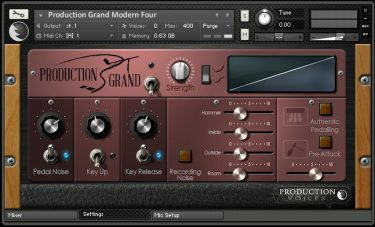 Production Grand Modern Four requires a full version of Kontakt 4.2 or Kontakt 5 and greater (not provided). For complete details, audio demos and manuals on Production Grand, please visit the Production Grand products page. 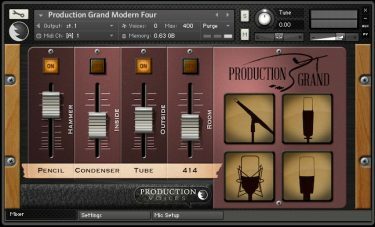 Production Grand Modern Four is ideal for Studio Production, Stage Production, Film Score Production, Performance and more! 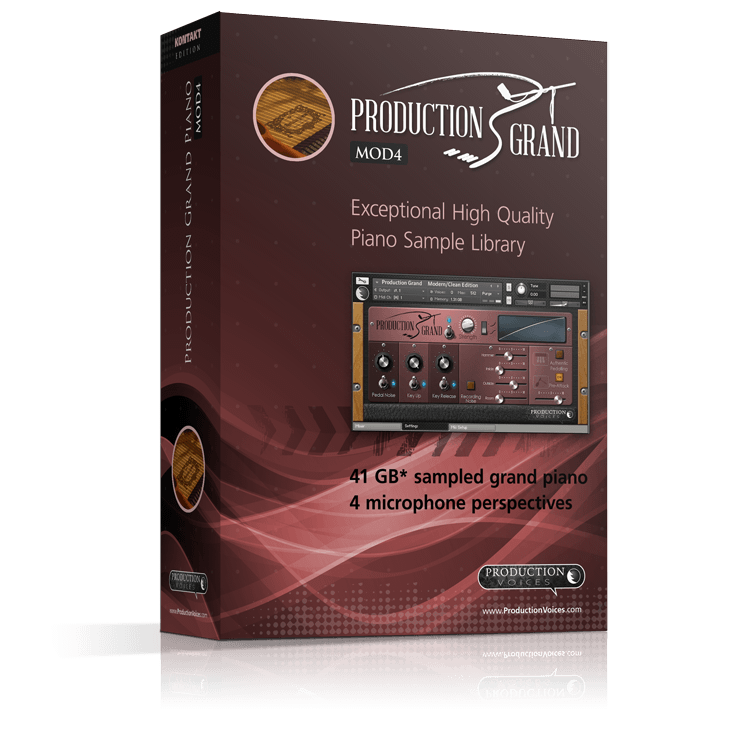 Note about file size: Production Grand Modern Four is provided in compressed format made in Kontakt. Kontakt’s compression format is loss-less meaning that it will sound exactly like the uncompressed WAV source files from the sampling session. Production Grand Modern Four source sample size before compression is approximately 41 GB! Immediately after purchase, download links are provided by email. The download is in 7 parts. Each download link is about 1.6 Gb in size. Total file download size is approximately 11.4 Gb. Only download three links or less at a time to avoid file corruption on download. Download times depend on internet connection speed. Requires NI Kontakt 4.2 or Kontakt 5 or greater (not provided). 14 GB of free hard drive space. Note: Compatible with the full version of Kontakt 4 or Kontakt 5 only (not provided). Not for use with Kontakt Player. *41 GB represents the fully uncompressed library with 16 bit 44.1 kHz samples. The files are delivered and usable in the Kontakt lossless compression format that compresses the samples from 41 GB to 14 GB with no audio quality loss. Production Grand Modern Four is upgradable to the full version of Production Grand for $199. If you are a Production Grand Modern Four registered user wishing to upgrade to the full Production Grand, delivered on USB 3.0 hard drive, please contact support and request the upgrade. 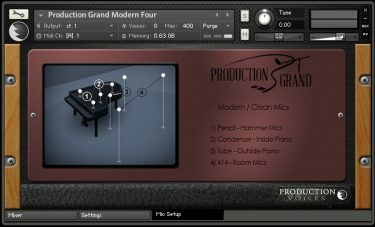 What is the difference between Production Grand Modern Four and Production Grand? Both function identically (interface and controls) except that Production Grand Modern Four only contains the first four of eight microphone perspectives with 16 bit 44.1 kHz samples. Production Grand contains eight microphone perspectives and two additional higher quality sample rate options: 24 bit 44.1 kHz and 24 bit 96 kHz. Production Grand is delivered on USB 3.0 hard drive with a courtesy download of the Modern Silver Edition to get users started before the hard drive arrives while Production Grand Modern Four is delivered by download only. Production Grand Modern Four is essentially the Production Grand LE Modern Edition. 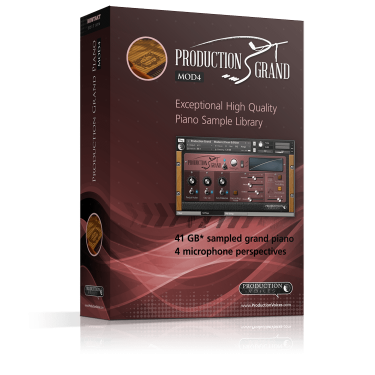 PDF Production Grand User Manual This manual covers the full version of Production Grand which includes the Production Grand Modern Four samples as Production Grand LE Modern Edition.